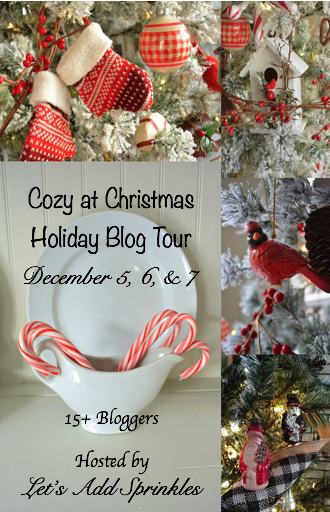 Cozy at Christmas Holiday Blog Tour. and welcome you today for a little tour. The porch is ready to greet friends and family. The glittered deer welcomes as friends and family arrive. and this year sports a pair of figure skates stuffed with winter greens. Santa is standing in the entry and ready to greet you. Come on in and stay awhile. So nice to have you visit. My tour today is right in the dining room. all is ready for Christmas! and a pop of aqua throughout my cottage. In the evening the lights on the garland frame a cozy glow! with red, white and a pop of aqua. Vintage school books lift and showcase among the treasures. This sweet little angel is a gift from Ginny, a dear blogging friend. where most of my family lived and many worked in that factory years ago. Bottle brush trees stand among my dishes and collectibles. Bringing in the aqua with a bowl of ornaments and a sweet aqua cow creamer. Old books with Johnson Bros. dishes and holly plates become part of the decor. Teacup plates hold a sugared red apple. My little house mouse is taking a nap. He is full from munching on an apple. This sweet decoration was a gift many years ago from my grandmother. standing on a tall pedestal table. and sprinkling glitter all over each rose. It's a bit messy but turns out great and lasts without yellowing. atop a vintage style window frame. I stuff the stockings with poly-fill to hang fuller. and added the white accents with a stencil. My talented hubby added the bottom shelf for the white bowls. This piece was white at one time, I may go back to that. I've placed two pegs side by side, and slide the stem bottoms in place. To each stem I've added a small candle ring for color. Love the music shoppe near by. I had to bring out this treasured one. Inside the little couple are singing carols. with a cup of tea and enjoy the tree. hung them in my ivory dream catcher on a side wall. Please take a seat around my table. Here I used a soft ivory tablecloth in a window pane design. To the center of the table I've layered a poinsettia topper. The cottage was a gift many years ago and part of a Christmas flower arrangement. A gift that keeps giving years later. In the evening, the light inside the cottage makes such a cozy setting. I could live in this cottage. See the family gathered around inside? I love this sweet charming treasure. On each end of the table, I've placed a beautiful Christmas tree plate. as pretty now and they were so long ago. Thank you mom, I love and cherish these hand painted by you. with drip catchers that have crystals tangling around. when we first got married 43 years ago. In place of real candles, I've added these faux candles from Ikea. but in person, the light is soft and pretty. Here is a better view of the poinsettia topper. All embroidered and cut out work on an ivory background with holly leaves. I layered The Noel patterned Christmas plates from England with red charges on white placemats. To the center, I've added a ring of rosemary. These are a find from Magnolia Market in Waco, Texas. The stemware and dessert cups have rings of gold with holly and berries all around. Years ago my Swedish daughter and exchange student gave me these goblets and dessert cups. They were gifts for dining at Arby's years ago. and in the fall, collected these for me. I love them my dear daughter and remember the memories every time we use them!! and held with a snow dove napkin ring. given to me as a gift for a wedding shower I gave for a special friend. They are perfect for all seasons. The crystals are designed in different shapes and stay in place year round. I usually put up two or even three trees each year. trees is placed in the dining room window. The skinny style makes it easier to move around the table. To this tree, I've added red, white, silver with aqua ornaments along with red birds. The tree skirt is red velvet with a silver snowflake design all around. And, my tree would not be complete here at "Rose Garden Cottage"
without large garden roses placed in the tree from top to bottom. To the top of the tree, sits a large fluffy red bow. looking out from the table and seeing my deer all aglow in the front garden. and all the many friends here in blogland who have made it special. blessings and God's grace this Christmas and beyond. carry us through the season and into the new year. I want to share one more thing. I'm using it to hold Christmas cards. to share cards and postcards for other holidays too. I'll be back throughout the month sharing more decor. Thank you for visiting my Cozy at Christmas Holiday Tour. It has been a joy to have you. Visit the participates below in our three day schedule. Katie from Let's Add Sprinkles! It is gorgeous. I love what you did with the post office box. I have the same one. Your china collection is amazing. What a festive and fun dining room filled with memories. Thanks for being part of our tour. Celeste, your home is so inviting! Day or night, it's easy to spot so many special little touches. You know I love the red and white transferware mixed in with Christmas. You really do have the touch! Oh Celeste your home is absolutely charming! I truly love the wonderful treasures once loved by your grandmother and mother. You and I share a love of Johnson Brothers and I just bought that exact same vintage mailbox. We truly are kindred spirits! Thank you for the lovely inspiration. Beautiful. I always love your Christmas tour. Oh, it's just lovely Celeste. I love the fond memories that you shared and that sweet mouse gifted to you by your nana! It's those kind of things that make Christmas so wonderful. Your tartan Santa is darling and your entire dining room is simply the coziest! Wishing you a very merry Christmas. Oh, love the post box as well! Love all these details and your black hutch is awesome! Everything is so inviting, this tour has been fun and nice to be apart of. Hope your Christmas is wonderful. Thanks for inviting us to see your decorations, everything looks beautiful. Hi Celeste! Oh how gorgeous your dining room is! Love your sweet skinny tree and your table looks so pretty! The center piece is so sweet! I really like your Roosters sitting in the garland on top of your china cabinet. Wish the top of mine was flat so I could do something like this! Oh, I just can't get enough of seeing your pretty home! Your front yard and porch are so welcoming for the advent season, my friend. I'd love to be a guest in your home and share a cup of tea in your beautifully decorated dining room, Celeste! You have so many special touches, from your pretty dishes, to treasures from your mom, nana, and friends, which add to the special coziness. Happy December to you and your sweet hubby. So pretty! It's so much fun to get a peek into everyone's homes to see their holiday style! Celestina Marie, Your Christmas touch and words are very special. You are so nice to share the many hours of your hard work. "Wow" incerdible. Your talent...your kind words for others and life stories shows us your Christmas spirit and wonderful heart! Merry Christmas! Absolutely lovely! I just love the memories that so many items hold for you from loved ones. Those are the pieces I always make sure to put out also. How cozy your room is lit up at night. So much of your décor can stay out all winter, which is perfect. I find myself a little envious of the things you can put out on your front porch. I could never do that because of the mounds of snow we will get!! This is breathtakingly beautiful!! Stunning! You have s special knack for making the most glamorously decorated room filled with so many elegant touches warm and inviting! thank you for this wonderful Christmas tour through your lovely, warm and cozy decorated home! Celeste, Thank you for sharing your beautiful festive home once again! I am just like you when it comes to being nostalgic with my Christmas decor. There are so many memories of years gone by. I have my mother's vintage glass blown ornaments that I put in a crystal bowl, and even plastic ones that were made during the war, when glass was unavailable. Everything looks so perfect and guest ready. I learned another thing about you. I did not know you had a Swedish exchange student! That is a wonderful memory of how she collected the stemware for you! How blessed you are, and how blessed we are that you draw us into your home and share your ideas, your thoughts, and your techniques! Merry Christmas! Celestina, your home is just stunning all decked out for Christmas! Your dining room is so pretty, I don't even know where to begin! I love your cake stand and cloche centerpiece, and the pretty plates that your mom made. What a treasure. Your hutch looks wonderful, so many great ideas you've shared! I think I'll take a que from you and hang our stockings from the wood and metal pieces I have hung on the side of our hutch. Great idea!! And I love your vintage inspired postal box, too! Thanks for sharing your pretty home with us!! Celeste your home is positively breathtaking! I love hearing the stories behind all your pretties! They have certainly been well loved and putting your Christmas cards in the vintage mailbox was so clever! Thanks for the beautiful tour! Celeste, you home is so warm and inviting. I love seeing all your holiday touches, the pretty Christmas china, and other details of your home. The swag on the back of the chairs looks great. I'm adding that to my Pinterest board! Celeste, I love the special touches you add to your home all year long, but especially at Christmas I find it so warm and welcoming. Thank you for sharing your home with us today. Oh my goodness...I don't know where to begin! Everything is absolutely gorgeous! I want to just get lost in them, to stare at them all day and night! It is such a treat to see your beautiful home and your collections through blogging. We love many of the same things- like transferware- so it is especially fun for me. Just one word: STUNNING. Oh and so very very very festive and homey. You are the best decorator! Tucked in among your dishes an collectibles I spotted an aqua ornament with splashes of gold. I immediately thought of a Christmas card I made this year ... be watching for it on my blog. Oh - and the cake plate. I've been lusting after one for years. One of these days I might get one! My dear friend your tour is perfect with every Christmas touch. You have amazing treasures from family and friends. Adore your cloches too. It's all so beautiful and festive! The cottage under the cloche is wonderful and the music shop is too. I love that they have a scene inside! You have some wonderful treasures! I love your porch and that big beautiful Santa. I would want to keep the decorations out all year long! Holiday hugs! Charming! Nice job ! Beautiful! Love the cottage! Oh Celeste, COZY as can be! We are all having such fun fixing up our nests according to our tastes. Reds, blues, even pinks, everyone's signature touch celebrates the LIGHT. My décor this year is more natural with antlers, pine cones and fur! I AM LOVING IT. Your home looks fantastic and festive. ENJOY! Celeste, your beautiful home really shines at Christmas time. I love your entry into the house-so inviting. Your dining room looks ready for Christmas dinner. Such a pretty tablescape. I love the platter from your Mom. Your aqua touches look amazing. I love how you use little gifts from your family members or friends to add to the coziness. Your home looks so festive! Thanks for sharing it with us. This is an amazing tour, Celeste. Not only do you have so many beautiful pieces and treasures, you have a way of adding them to your home in such a precious way. Your dining room really has me swooning...I so wish I could leave my table set 24/7! What a lovely way to share our love of dishes. I have Winterberry dishes and wine goblets. I always think I'll add but then I forget after the holidays are over. I actually think it might be fun to add some sort of solid holiday color to the collection to mix it up!!! Wow! Everything looks great! Your doorway is so welcoming and festive! The sled with ice skates is great! Your dining room is a show stopper! Absolutely gorgeous!! Everything is warm, welcoming and exquisite! I especially love the urn on your front door!! My Dear I have just spent the entire evening enjoying your divine holiday decor in your beautiful home. I love each and every detail you so brilliantly put together. Thank you very much for sharing your home for the holidays. What a special joy this is for me to see your home delicately and festively decorated for Christmas with such beautiful and special selections. Your thoughtful attention to detail shines through out each vignette, table-setting and hand decorated piece. I enjoyed learning a bit more about you,and I knew that your home would represent Christmas goodness in the very best way! Lovely Christmas decor. Inviting, pretty and welcoming, just like you! I enjoyed the tour of your home. I absolutely love your front door wreath. So well done and very inviting to your beautifully decorated home. Celeste I enjoyed a leisurely stroll through your beautifully appointed home. You have captured the sense of childlike wonderment and the sophistication of an artist. It is decked to the nines and welcomes in holiday spirit and cheer. Everything is so beautiful, warm and inviting! I love all the details especially the sentimental ones. From the skates with the greens to the urn on the front door everything is so welcoming. Love the dining room and your mother's dish. I have a few things my mom did in ceramics too- always fun to go down memory lane with them. Looks like you are all ready for Christmas! Everything is beautiful. I remember the first time I saw your French post cards that are on your front door, and have loved them ever since. I often think of them during the holidays. Your home looks gorgeous! The color theme you have chosen is perfect. Have a very Merry Christmas! Thanks for the ur home looks wonderful!! Oh my Celeste this was such a stunning tour of your front area and your Gorgeous dining room. I will just have to say that I love absolutely everything you have done here. The first thing your front porch is just wonderful and is so welcoming, love the bird houses and what a great first treat as you come up to the house. I love the stockings framed by those windows that is just too cool on either side of your gorgeous hutch filled with so many lovely dinnerware, I just love how you have so many special pieces that remind you of gifts from family and your exchange daughter saving all those cups for you that is just so sweet! Your place settings and centerpiece are just lovely too and the glow of everything at night is just so cozy and warm and I do love how you can see the deer out front also!! Wishing you and your family a very blessed Christmas too!! Dearest Celeste, your home looks amazing and what joy to know we get to see more :) I know I say this all the time, but you have such a special gift for decorating and making a home warm and inviting. Beautiful, my friend, truly beautiful. Wishing you a lovely week! Hugs to you! Your home looks fairy inside and outside. Every single decor is dreamy and i especially love your gorgeous Christmas tree. I love the pops of aqua in your Christmas decor. Everything is just beautful. Merry Christmas! Your home is absolutely stunning! I love all the little touches and those plates your mom hand painted are so beautiful! I love your tea pot and cups and I also noticed your blue cow too! Is it a creamer or for gravy? Love the color! The candle holders are gorgeous and I love that you still have and cherish them after your husband bought them 43 years ago, how special... love hearing stories like that expressing love and special times. Looks like you are ready for the holidays :-) Have a wonderful evening! Oh Celeste, your home is sooooo inviting - all is dreamy! Your dining room is such a welcoming spot for your family to gather during the holidays. Absolutely stunning! You have such a gift for artistry and decorating. Your home is so beautiful and definitely a Christmas wonderland! The dining room is amazing and I love that you can see the reindeer outside. You have so many unusual decor items and lots of memories too. Thanks so much for allowing us to visit! Everything is so festive. Beautifully done! What wonderful Christmas decor. The porch is just lovely. My favorite at Christmas is the home tours. Everything is so pretty!! Merry Christmas. Hello Celestina, wow I love how nice you decorated your beautiful home for the Christmas. I hope you are enjoying the holidays. Wishing you and your family a Merry Christmas. Celeste your home is gorgeous and cozy for the holidays. Your table is gorgeous and love all your pretty dishes. Just so pretty. Happy Holidays. A most beautiful and cozy home for Christmas Celeste..you out-do yourself every year! Merry Christmas to you and your family!! It's such a beautiful room, Celestina, and you've decorated it so perfectly!